Translated as the “eight-horned fennel,” this native Chinese spice is an irregular star-shaped fruit with eight carpals joined around a central core with each carpal containing a seed. Its strong, sweet licorice characters and deep, warm spice notes are reminiscent of clove and cassia. The licorice-like, pungent flavor leaves a lingering and numbing bitter aftertaste. 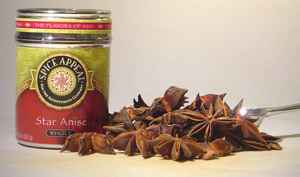 Star anise gives a spicy, sweet flavor that becomes more intense as it is cooked. Characteristic of Chinese and Vietnamese cooking. Use in marinades, barbecues, roasts, stews and soups that require long simmering. Goes well with roast poultry, pork and duck. Add to Vietnamese beef noodle soups. Tasty in Malaysian and Singaporean curries and sauces.